Congratulations on your beautiful magazine feature. I've had you on my mind for several days. How are YOU? And, how are the girls? Bet they are growing like sweet dandelions. Congratulations. I am going to look for the magazine tomorrow. What fun. Congratulations on your quilt on the cover!! It is so pretty! Oh, I am working on a leader ender project now. I must get the magazine. 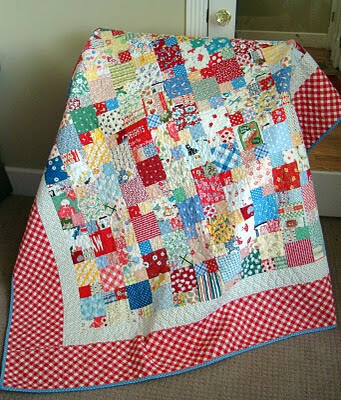 I have your other one with a quilt on the cover too! Congratulations! You have been thought of and missed. I'm so glad to find your blog! Congratulations for the publication! The quilt is beautiful! Looking forward to more inspiration! Cheery wave! Congratulations !!!! Your quilt is so beautiful !!! Congratulations! This has always been one of my favorite quilts. I made one myself a few years back. I love the colors in yours, especially the red bias gingham. Oh how EXCITING! That's wonderful news! Congrats! Congratulations...I do love that quilt, it's so happy! I'm sorry, but I had to chuckle when I read the first two lines of your post. It sounded like an AA confession or something. Congratulations on the magazine feature! Very well deserved -- I love your picnic quilt! I hope you're slowly getting better -- how are things??? How nice to see you back. 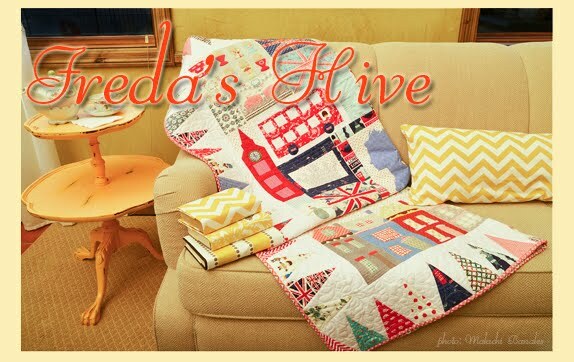 It's so exciting to have a pattern and a quilt in a magazine. Congratulations!!! 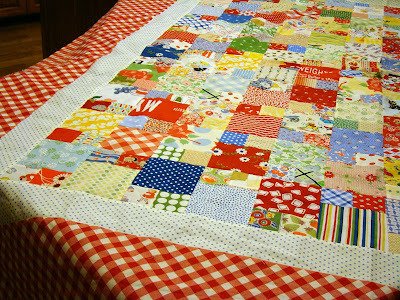 I love this scrappy quilt. Good to hear from you again. Glad to see your beautiful work getting the recognition it deserves! It is a perfect scrap quilt. Such a happy quilt! Congratulations on it being published. Congratulations, Miss Cover Girl! I will have to pick it up the next time I'm out. Congratulations! 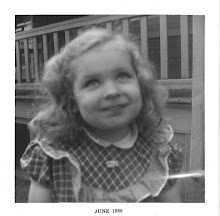 It is so good to see you blogging again. Your quilt is gorgeous. I am so happy for you. Congrats on the publication! Glad to see you back posting! I was concerned! 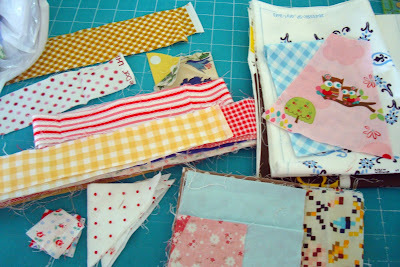 I put your tutorial on my favorites list and then decided to divide up some red/white/blue scraps into 2 1/2" and 4 1/2" piles! Thanks for sharing!! Well, how cool is that? Congrats! It's a winner. Just bought the magazine today and I'm going to make this for my kitchen table !!!! Love it! I have used your tutorial twice now, just love it. Fun to pull fabrics and see how they all manage to come together so nicely. Thanks! !